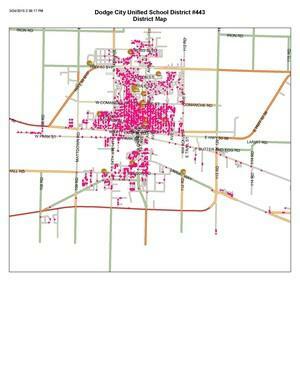 Each dot on this map represents a family with a child enrolled in Kindergarten-Fifth Grade. One dot may have one child while another dot may have five children. What's important to note is the frequency of dots in some areas and how sparse the dots are in others. If you look in the areas around Linn Elementary, Beeson Elementary, Sunnyside Elementary, Wilroads Gardens Elementary (not shown on map) and Ross Elementary, there are not enough "dots" to fill those schools. However, if you look at the areas around Central Elementary and Miller Elementary, just going a few blocks from those schools would fill those buildings. The majority of the children in our community live in the center part of town. The children who live by Beeson and Linn, for the most part, do attend those schools, but we can't fill them with only those children. We also can't accommodate all of the children in the areas of Central and Miller in those two buildings. Hopefully that explains why we don't have "neighborhood schools!"